Brief Synopsis – A rancher gets involved in a land dispute and decides to do all he can to keep his land. My Take on it – Being a fan of Glenn Ford’s career in film, I easily picked this film for this series because I hoped for another great Western. Unfortunately, besides his performance in this film, there isn’t much to enjoy. Even the addition of Edward G. Robinson doesn’t manage to help make this any more interesting because he feels miscast in this role that is more laughable than iconic. The story itself is quite mediocre and they pace things in a very strange and inconsistent way. The film has lots of dramatic and action scenes, but they don’t manage to bring both of those elements together in a way that makes things enjoyable. The editing is a bit sloppy and not everything flows well enough. The romantic side stories that they present us with also don’t seem to work and in some cases feel much too forced. 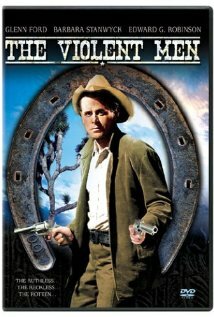 The biggest issue that this film faces is the fact that they try too hard to cram into the story so many stereotypical Western elements that the tend to forget that viewers want to see something unique but also something that can stay interesting from start to finish and this film seems to miss that aspect of things. Bottom Line – Ford is great in this film, but the story is somewhat mediocre and moves along at a strange pace. The action and dramatic scenes presented here just don’t blend well together and it seems as if things have just be edited together even if things are lacking throughout. The romantic side stories also don’t seem to work and the biggest issue with this film is that it tries too hard to include all kinds of stereotypical Western aspects into the story, it forgets to keep things interesting enough. Even Robinson seems miscast in this film.